A new Massive Open Online Course #PLENK2010 begins. First week and the topic is to clarify the concepts of Personal Learning Environments (PLE) and Networks and to evaluate it against our own experience with the intent of developing a comprehensive understanding of them. On the following, there is a Learning Design Diagram (hybrid abstract model) (1) that reflects the passage from Closed Models to Open Models of learning Design from my own experience. On the diagram above, we can see the changes that remain on Learning Models Design with the emergency of Web 2.0 environment. 1. From linear learning to interactive learning hypermedia (links + multimedia). 2. Instruction to the construction of learning and knowledge discovery. 3. Of learning focused on the expert teacher by learning focused on the learner. 4. Absorb the content and knowledge to learning how to learn, think critically and navigate. 5. Learning to learn mass customized. 6. Learning bored by inactivity to learning fun and challenging. 7. Of learning that define the teacher as a transmitter to learn that it is the teacher as a facilitator. 8. Of learning by interacting only with materials, to learn by interacting others also networked synchronously and asynchronously. 9.Traditional environment has changes to sensitive environments that influence on interpretation processes. 10. From consumption of information to User Generated Contents (CGU). When reading from the reviews, Ruth´s presentation(3), papers and diagrams about Learning Design Models, we can find different terms about them: Learning Management Systems (LMS) ,Virtual Learning Environment (VLE) (4), Content Management System (CMS), Personal Learning Environment (PLE) (5), Personal Learning Network (PLN)(6), Massive Open Online Course (MOOC), among others. Different Paradigms as Behaviorism, Social cognitivism, Constructivism,Andragogy (Adult learning), Connectivism, Design Based, Humanism and many theorists (B.F. Skinner, Jean Piaget, L. Vygotsky, Dewey, Vico, Rorty, Bruner Stephen Downes, George Siemens, Colin Milligan, Malcolm Knowles, etc…) try to name the learning experience and develop a model that represents accuracy the learning process. All of them are organized on models from the epistemology that are reflected on their own field and language domain. There were many efforts to offer a model and makes a definition of the learning design. Many of the theories offers different ways in which conceptualize and discuss about the problems and benefits of Learning Design. Most of those ways, have a ‘pedagogy’ behind, comes from common places and beliefs about “Learning” and bring up new problems from other places. So, scientific theories have scientific vocabulary and language with wich they assign words to ideas. As we can observe from the papers of this week, there is a semantic difference among terms. Apart from the differences of approach, most of the theories have a common way in which named their models. The use of Metaphors to label models is the way in which perceptions, values and paradigms from theories are reflected. Metaphors show us the way in which we must understand concepts. So the more naturalized they are, the most efficient in their use. But, what are the reasons that make metaphors of Personal Learning Environment (PLE) and Personal Learning Network (PLN) effective? Which implicit values do they have to improve learning? Regarding the first question, the transition to Web 2.0 makes the possibility to design learning centered on the learner. So Personalization is the main concept that reflect a change of model. Environment and Networks are words that associated to the concept of “Personal” connote different senses. services, weblogs, wikis) within what may be thought of as the practice of personal learning using technology” Dave Cormier (1). “The distinction, is that the folks who talk about PLN are focusing on the people who make up the learning that they are doing and believe that the PLE people are mostly concerned about the technology that makes up the learning space. (blogs, wikis, webpages, forums, broadcasts etc…)” . Which implicit values do they have to improve learning? PLE and PLN are terms associated to interactions, to networking in which a learner is engaged to others on open environments, including education, work, and leisure activities.This terms reflect a new organization of the learning experience (for the longlife) where critical thinking, collaboration, and user content creation are main features. Summarizing, as the scientific fields are discursive fields, in the evolution of the sciences and their epistemologies, appear new languages and fragments of the knowledge that makes new contributions to the disciplines. 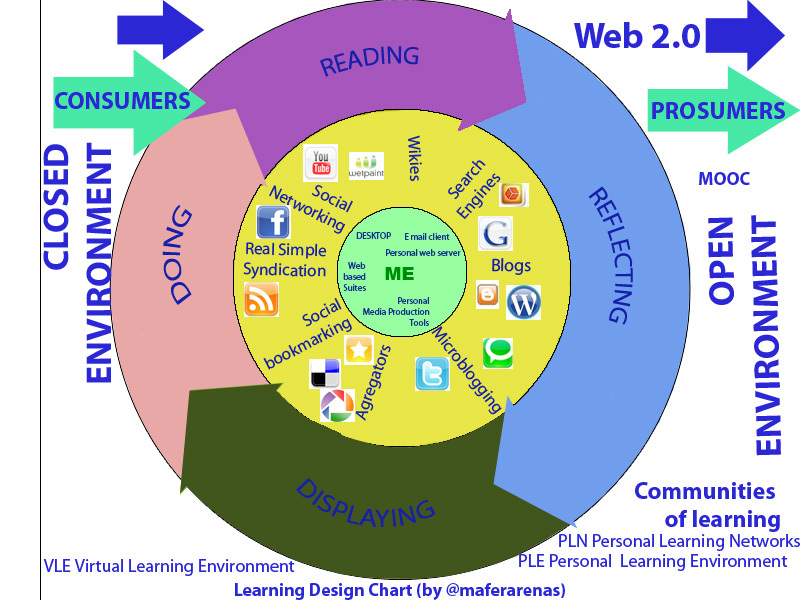 On Learning Design, we can identify this process and find that PLE, PLN concepts acquire new semantic dimensions that reflect a way to model the reality of web 2.0, the new subjectivity and social interactions. This entry was posted in LEARNING ENVIRONMENTS and tagged Agregators, Andragogy, Behaviorism, blogging, Bookmarking, Bruner Stephen Downes, CGU, CMS, Colin Milligan, connectivism, Constructivism, Delicious, Design Based, Dewey, Facebook, George Siemens, Groupware, Humanism, interaction, LMS, Malcolm Knowles, Metaphor, Metaphors . Web 2.0, microblogging, Models, MOOC, Paradigm, PLE, PLENK2010, PLN, Rorty, RSS, Sensitive Environments, Social Networking, Technorati, Theories, Twitter, Vico, wiki. Bookmark the permalink. So there is a distinction between a PLE and PLN with regard to humans and objects? Let’s say that I choose to participate in Wikieducator (http://wikieducator.org/Main_Page). There are many reasons why I might choose to be a part of this community, each being a separate node to my PLN: forming strong ties with individuals, forming weak ties with individuals, contributing to content, adding content, redistributing content, facilitating a workshop (affording strong and weak ties with individuals), etc. Now, as I contribute to an open educational resource, for example, I may also be moving in-and-out of various relationships or ties with individuals. In other words, there is a lot of overlap if one chooses to distinguish between a PLE and PLN. That’s why I avoid it…it’s all a PLN to me. It is very interesting your distinction of PLE and PLN. I agree that on both concepts the social value is underneath of both. As I wrote on my post, differences on concepts comes from languages of sciences domains. For example,Instructional Design Model may have technical approach to the way in which nominates the Learning environment and Connectivism might focus on the interconnectivity and interactions. I congratulate you for belonging to Wikieducator ´s community. It is an opportunity to develop relationships and make new connections on learning. I participate too in many communities and experienced different ways the interaction and the collaborative work and knowledge. I kind of skipped over the difference between a PLE or PLN debate, But i am getting a little more interested now that i have seen a few summary blog posts. I shall give it some deeper thought this week but i agree that most people would associate PLE with technology and PLN with people. I also agree with Benjamin in that there is a lot of overlap so in my mind i just describe it as connectivist learning (in which you use a range of tools to connect with people and resources). As PLE and PLN are mainstream language in the VLE/PLE debate i guess i need to clarify my own thoughts on this topic. I agree with you about the differences in the interpretation of the PLE and PLEN concepts and conceptual nuances on VLE. I hope the following will read deeper meanings. We will gladly follow your posts and I’ll be writing. I agree with you about the differences in the interpretation of the PLE and PLN concepts and conceptual nuances on VLE. I hope the following will read deeper meanings.